Thank you for your letter of November 26, to the Occupational Safety and Health Administration (OSHA) requesting an interpretative ruling regarding the applicability of the Hazard Communication Standard (HCS), 29 CFR 1910.1200, to heat shrinkable polymeric products ("heat shrink products"). (1) Does the potential release of hazardous substances from heat shrink products due to overheating or burning during installation constitute a "normal condition of use" or a "foreseeable emergency" under 29 CFR 1910.1200(b)(2) which places these products under the HCS regulations? If so, (2) are heat shrink products exempt from the HCS as "articles" under 29 CFR 1910.1200(b)(6)(v)? As you point out in your letter and as required by section (b)(2) of the HCS, the standard applies to "any chemical which is known to be present in the workplace in such a manner that employees may be exposed under normal conditions of use or in a foreseeable emergency." (Emphasis added). "Exposure" is defined in the HCS as including "potential (e.g., accidental or possible) exposure." If there is the potential for overheating during workplace use of the product, i.e., if equipment failure can be normally anticipated during workplace processing operations and result in overheating the heat shrink product causing employee exposure to hazardous chemicals, then the product would not be exempt from coverage. As explained in the standard itself and in OSHA's Compliance Instruction for the HCS, CPL 2-2.38C, chemical manufacturers are responsible for performing a hazard determination on the chemicals they produce to determine if, during their anticipated or known use, exposure to hazardous chemicals might occur to downstream employees. The OSHA Instruction, on page A-9, includes equipment failure and failure of control equipment as situations that could cause a "foreseeable emergency" and result in the release of hazardous chemicals with resultant employee exposure. The chemical manufacturer must consider potential exposures, including accidental or possible exposures that may occur when downstream employees use the product. Only by considering all the exposure scenarios that may occur during normal use can the manufacturer truly assess the hazards encountered during anticipated use of his product. Equipment failure that results in the accidental overheating of the product is certainly an exposure scenario that should be anticipated by a manufacturer during his hazard determination process. OSHA does not perform hazard determinations on chemical products for manufacturers and is not doing so by this response for the heat-shrink products you produce. If, however, as the chemical manufacturer, you have information that overheating via equipment failure or maladjustment, etc., can be expected to occur a percentage of time during normal workplace handling of your product, then employees have a right to know the hazard information associated with the resultant potential exposure and your product would be covered under the requirements of the Hazard Communication Standard. Your letter refers to "misuse" of a product and questions whether the HCS applies if a product is "misused." 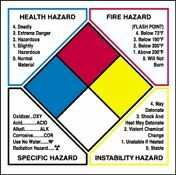 The standard does not require hazard information transmittal for exposures that result from intentional misuse. However, exposures resulting from "accidental misuse" such as you described in your letter are covered since hazardous chemical exposures can be expected to occur a percentage of time with normal use when equipment fails, overheats, or otherwise is not operating as the manufacturer intended. Accidental exposures are part of normal operating procedures and should be anticipated by the chemical manufacturer during the hazard evaluation process. This interpretation is not different from the performance oriented approach taken by OSHA in its clarification that, under "normal conditions of use and as the result of foreseeable emergencies" a percentage of glass mercury switches can be expected to break during normal installation operations (Federal Register Vol. 52, No. 163 p. 31865). "In these cases, installation is the 'normal condition of use' for the employees installing the items, and thus hazard information is required for these intermediate uses. Once installed, these items would be articles and thus exempted." In your letter, you state that "[i]f the HCS does apply to heat shrink products, then end users of these products should receive uniform notices and warnings of potential hazards from misuse of these products." OSHA does not and can not issue warnings to users of a product to inform them that "the HCS applies to them." However, letters of interpretation such as this one are uniformly included in OSHA's Computerized Information System (OCIS) and are disseminated on-line to all OSHA offices throughout the country. In this way, OSHA compliance personnel are notified of clarifications and interpretations of the performance-based requirements of the HCS and are able to utilize such information in their compliance assessments. We hope this response has clarified the issues and concerns you raised. If we can be of further assistance, please feel free to contact us again.